The Tyrone manager was speaking at the launch of a major fundraiser for the foundation established in the memory of his daughter. 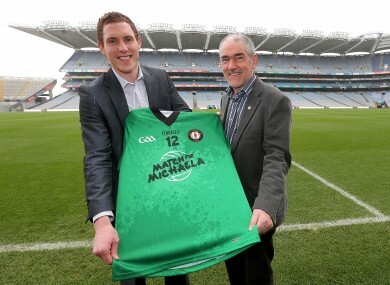 John McAreavey and Tyrone manager Mickey Harte at yesterday's launch of a Match for Michaela. MICKEY HARTE HAS revealed that he never considered stepping down from his position as Tyrone manager despite the traumatic death of his daughter Michaela when she was murdered on her honeymoon in Mauritius January 2011 and the acquittal in July of this year of the two men who had been accused of killing her in Mauritius. Harte described fulfilling the role of Tyrone manager as ‘a great way of looking at life’ and ‘a huge source for positive force’ for himself and his family. Harte was speaking yesterday along with Michaela’s husband John McAreavey in Croke Park at a launch for ‘Match for Michaela – A Festival with Football’ which is a major fundraising event on November 3rd in Casement Park. The event will feature a Gaelic Football match between All-Ireland champions Donegal and an Ulster selection with all funds raised going towards the Michaela Foundation. “It never ever entered my head (the consideration not to manage Tyrone),” said Harte. “Absolutely not. I’m grateful for the privilege of being able to stay there and do that because it is is a great distraction, a great diversion, a great way of looking at life. “Life must go on. Yes, things are different, it will never be the same. But there are people around us. There are opportunities around us that will help us through. Harte admitted it has been difficult at times to focus on his management role but believes it is not possible to quantify the impact the tragic passing of Michaela had on the Tyrone squad. “It’s hard to quantify these things. On reflection you might say all of these things take from your energy source to deliver where you want it to go. I wouldn’t like to lean on it or use it but I do believe for the last couple of years not only has this had an impact on us as a family but for the GAA players of Tyrone that I work with. “A lot of those people knew Michaela very well. You can never quantify how does it impact on them, just like we go back to the loss of Paul McGirr, the loss of Cormac McAnallen. It doesn’t be over when it appears to be over. Email “Mickey Harte: 'The GAA has been a huge source of positive force for me'”. Feedback on “Mickey Harte: 'The GAA has been a huge source of positive force for me'”.